Suzie and Chris were married on October 18th at Atlantic Bay Resort in Tavernier, Florida. 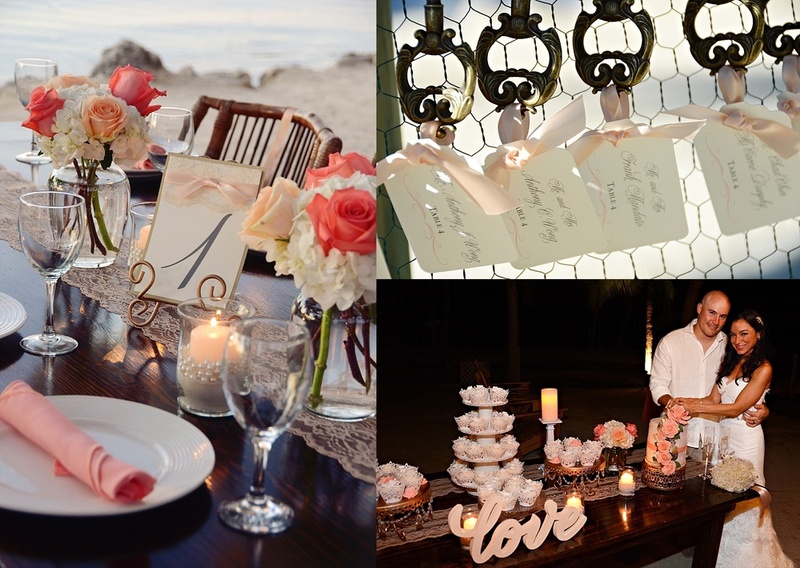 The inspiration behind their wedding was Vintage Beach themed. They envisioned a beach wedding, without the traditional beachy style that you are accustomed to seeing. Suzie said that once they selected the venue and she chose her Chantilly Lace Dress everything just fell into place. Some of the elements used to bring their vision to life included vintage keys for place settings, a globe signature book and a piece of vintage luggage for the card box. In addition, the bridesmaids wore coral, peach and french vanilla dresses and parasols that complimented the theme perfectly. "My favorite memory of my wedding day was Chris getting so excited that he said "I do" too soon, and my officiant - my brother, AJ, telling him to slow down, she's an attorney, so I need to do everything by the book." When we asked the couple to give us three words to describe their wedding the said: Best...Day....Ever!